6 October 2018 is the day when Latvian citizens in the country and abroad will elect parties and deputies that will work in 13th Saeima. 954 election sites in Latvia and 121 election sites abroad will be open today from 07:00 to 20:00. Central Election Commission reminds that to participate in Saeima elections, persons require a passport of a citizen of Latvia. Voters who only have ID cards will have to be issued with a special voting certificate. It is possible to receive the certificate in the regional branch of the Office of Citizenship and Migration Affairs free of charge where voters received their ID card. Ballot storage sites have been established in 37 of Latvia’s municipalities that have at least 7,500 voters. 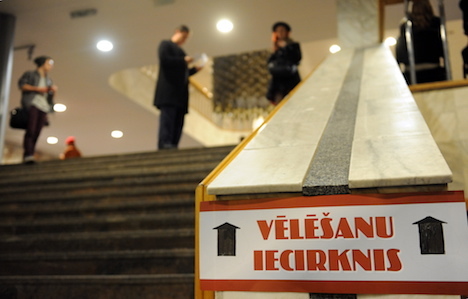 Addresses of election sites at which it is possible to hand ballots for storage can be looked up at CEC website www.cvk.lv or by phone (67049999). A total of sixteen parties with a total number of 1,461 candidates are participating in elections. The average age of candidates is 46.5. The youngest candidate is 21 years old, whereas the oldest is 88 years old. Seven candidates have primary education, 294 candidates have secondary education, whereas 1,160 candidates have higher education. 99 candidates are single, 568 are married, 41 candidates are divorced, and 5 candidates are widows. 748 candidates have decided not to disclose their family status. Once every four years, Latvia holds parliamentary elections on the first Saturday of October. Latvian citizens aged 18 or older with voting rights are allowed to participate in elections. Saeima elections are held in five election regions – Riga, Vidzeme, Latgale, Zemgale and Kurzeme. Elections are also organized in foreign countries as well. Voters with residence declared in foreign countries are added to the total number of voters in Riga election region, explains Central Election Commission. Saeima elections last for one day. Election sites are open for voters from 07:00 to 20:00.